Neoprene (Chloroprene Rubber) has excellent resistance to oils, ozone, sunlight and aging with low permeability to gases. It is recommended for use with gasoline and non-aromatic solvents. 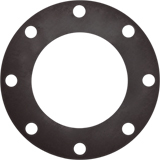 Neoprene gaskets offer little resistance to and should not be used in strong oxidants, and aromatic and chlorate hydrocarbons.